Last night, Dylan and I had the pleasure of attending “Drinking with Dinosaurs,” a special “Culture & Cocktails” event put on by the Springfield Museums. While sipping wine, we roamed the halls of the Science Museum – the perfect date night am I right? 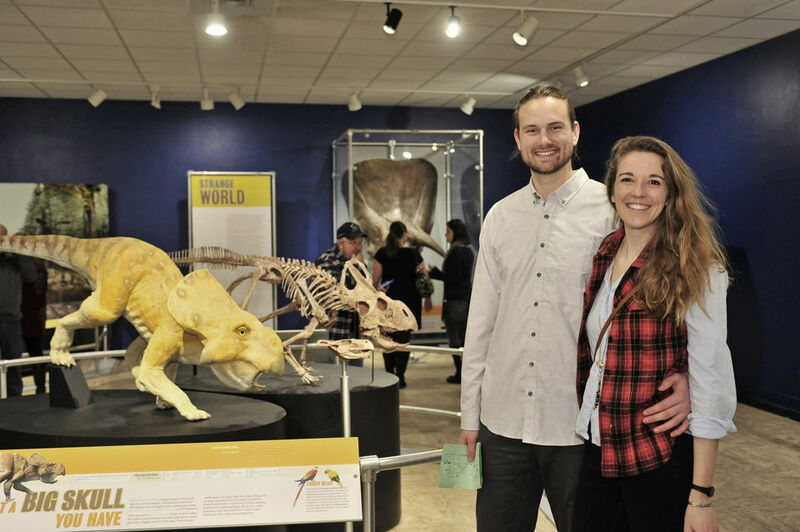 The highlight of this event was “Dinosaur Discoveries: Ancient Fossils, New Ideas”, which is on exhibit in the Springfield Science Museum until May 12, 2019. The exhibit focused on new technologies that reveal how dinosaurs really lived, moved and behaved. Dylan recalled his favorite dino movies as a kid – where T-rex’s tail dragged on the ground like a dragon. That myth was thoroughly busted. On display we viewed realistic models and casts and saw simulations of how dinosaurs walk, run and move their long necks. Sauropods, or the long-necks as I call them, couldn’t lift their necks as high as “The Land Before Time” led me to believe. They weren’t eating tree stars at all! Equipped with long front legs, Sauropods grazed on plants as high as 20 feet but with their head, nonetheless, angled down. Sauropods are the cows of the Jurassic! Cattle also graze, but their neutral stance isn’t with their head angled down. They’ve evolved to keep their head and neck in a neutral upright position. Unlike the 80 metric ton Sauropod, cows are prey animals and must stay alert to protect themselves. Also worth mentioning were the Raptor Churros with cheese sauce. Sweet and cheese are my favorite combo!